The auto enrolment of staff in Minerva means that academic, technical and support staff have access to all course and module information. This also means that you will receive emails when announcements are sent out, this is potentially helpful as it means all staff are aware of issues across the school. All these emails will have the text [SITS] in the title. You will see an increase in emails. You have two options, filter them so they don't fill your inbox, or stop them. Filtering means you still have the information and the filter will always work, year after year. Switching off means you will not receive the information at all, it will only work for this year, you'll have to go through this again every year. 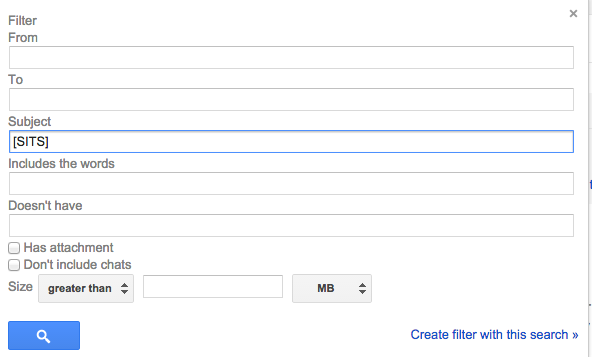 It's easy to create a filter Gmail which will label announcements as 'Minerva Announcements' and archive them. They won't appear in your inbox. Type [SITS] into the subject heading and 'Create filter with this search. "Skip the inbox (Archive it)"
Give the label a name, Minerva Announcements. You will now have a label on the left under Inbox / Sent Mail etc called Minerva Announcements with all announcements you're ever received filed in it. *a previous version of this guide included a download link to a filter which did not work, if you have used this guide you may already have a filter under this name.